Our printed Snap Bands can be used either as reflective Arm band or Ankle bands, they help to provide an effective, low cost enhancement to road safety. Ideal for local authorities and child & road safety campaigns. Reflective Snap Bands not only provide visibility, but are a fun and ideal way of carrying your promotional message. As standard our Snap Bands have a soft velvet backing, ensuring comfort. We can provide unprinted and printed Snap Bands up to 4 spot colours, full colour print is also available. 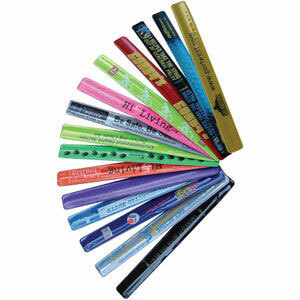 Your choice of 6 different size options and a choice of 22 colours for the band. Also available in EN13356 certified material.